If you have a towbar installed on your car, several legal rules and requirements are in effect. 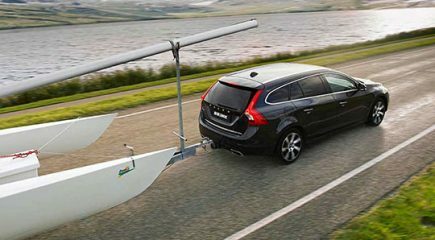 If you are driving with a trailer, caravan, boat trailer or horsebox attached, there are many rules to follow at home and abroad as well. During the MOT test, your towbar construction is checked as well. Your towbar ball should not be too worn and the locking mechanism should function properly for a detachable towbar. In addition, three important requirements are checked. The towbar has to have a type test. This is listed on the type plate of your towbar. If the type plate is missing, you may only tow a trailer that weighs less than 750 kg, load included. In addition, your trailer including load should not weigh more than the total weight of the towing car. When towing a trailer, your car should have indicators on the side. The weight with which the coupling of your trailer, caravan, boat trailer or horsebox pushes down on the towbar, should not exceed the limit set by the towbar manufacturer. This value is listed on the type plate of your towbar. In addition, check the Hand Book of your car and the towed vehicle, as other values might be listed there. The basic principle is that the lowest value determines the maximum weight, which you should never be exceeded. It is not allowed for the towbar to (partially) cover your car’s license plate. If the plate is covered or partially covered, you need to move the license plate and adjust the license plate lights. A towbar with detachable ball could be an alternative. 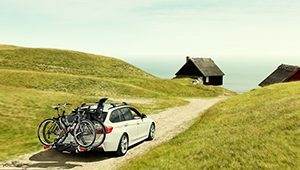 The rules and regulations with regard to towbars and trailers are subject to change. We recommend regularly checking the DVSA website in order to stay abreast of the latest applicable rules and regulations. 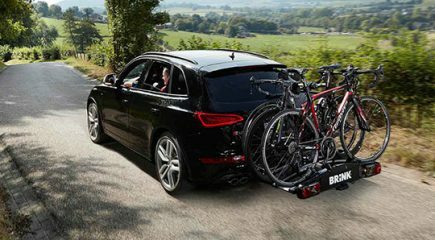 Which lights should your bike carrier, trailer, caravan, boat trailer or horsebox be equipped with? The answer to this question depends on various factors, such as the weight of the towed object and the lighting functions available in your car. The car manufacturer determines how much weight your car can tow based on test data. You can find this load on your VIN plate. 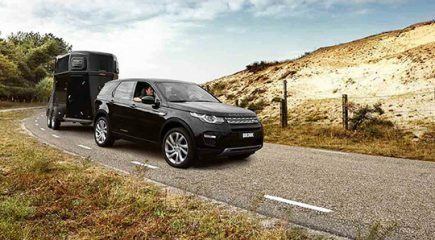 In order to guarantee safety, you should always keep within the limit of this so-called horizontal load with your loaded trailer, caravan, boat trailer or horse box. Which category driving license do you need in order to be allowed to tow a trailer, caravan, boat trailer or horsebox? This is determined by the weight you want to tow with your car, which influences whether you need a B, B+, or BE driving license.